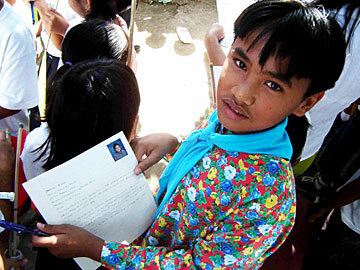 Fourth-grader John Agno, of Ruiz Elementary School in Sarrat, Ilocos Norte, got a new pen pal yesterday from Kalihi. SARRAT, Philippines » It's a long way from the urban neighborhoods on North King Street to the rural barrios among the rice fields in Ilocos Norte, but the ties just got closer for children at nine public schools here and in Kalihi. A sister-school relationship was inaugurated yesterday in Sarrat, Ilocos Norte, with a promise of friendship. Star-Bulletin reporter Craig Gima is on assignment in the Philippines, where Gov. Linda Lingle is leading an official visit to celebrate the 100th anniversary of Filipino immigration to Hawaii. State Rep. Dennis Arakaki brought pen-pal letters from Kalihi-uka, Farrington, Kalihi-waena, Kalakaua Intermediate and Fern schools to students and teachers at four schools in Sarrat, a city near the provincial capital of Laoag that proudly proclaims itself as the birthplace of the late Philippines President Ferdinand Marcos. Even though it was Saturday, students, dancers, singers and band members greeted Arakaki and Sarrat Mayor Corazon J. Ruiz-Abad at the schools and thanked them for their help. "Imagine, you already have a friend from Hawaii -- from Kalihi-uka," Ruiz-Abad told the students at Sarrat North Central Elementary School. From Honolulu, Chelsea Ganitano, a fifth-grader, writes to a future friend that she learned the first sakadas, contract workers from the Philippines, came from the Ilocos area. "I hope you can help us celebrate this important event with us by sharing with each other our culture and history." At North Central Sarrat Elementary School, a shy Felaome Grace Gamtala said she only knows Hawaii is a beautiful place. She said she'll tell her pen pal that she wants to be a doctor. Arakaki (D, Alewa Heights-Kalihi) said the new relationship is dedicated to the future and invited them to visit Hawaii through student and faculty exchanges. The teachers wore their school uniforms -- red dresses with a hibiscus print -- a gift from an alumnus from Hawaii. At another school, the Hawaiian-style uniforms were yellow with red flowers. People originally from Sarrat, from Hawaii and elsewhere have donated educational supplies and even helped build classrooms and libraries for schools in the area. But the need is ongoing, said Eliza B. Dorotay, the district supervisor in the area. "We need computers," she said. Dorotay is supervisor of 15 schools in the district. Dorotay said there's only one computer at the elementary school for student use. About a dozen computers in a room at Sarrat National High School are shared among 1,800 students. Their instructors would like more computers so that the students can have more time online. They also want a high-speed Internet line. Right now, surfing the Internet is a slow and time-consuming process. At Ruiz Elementary School, the teachers and students asked for volleyballs and basketballs. Arakaki said their sister schools in Hawaii are arranging to donate used textbooks and other school supplies. He asked about what kind of textbooks are needed. Math, science, social studies, he was told. Also books in English that students can use to practice reading. Ruiz-Abad selected the four schools for the program because they are among the poorest in her area. Of the 300 children at one school, perhaps only 20 percent will graduate from college, Ruiz-Abad said. About 30 percent won't go to high school because it is too expensive or they are needed in the fields. Even though public education is nearly free, the extra costs like bus fare, even lunch every day, are more than some families can afford, Ruiz-Abad said. Arakaki, Jun Abinsay (D, Kalihi-Kapalama) and Rep. Michael Magaoay (D, Schofield-Kahuku) are sponsoring two boys from schools in the area. They'll pay about $100 a year to cover those extra costs for the boys until they graduate. They've also pledged to pay for their college tuition. Driving between schools, it's easy to see the influence of Hawaii on the area. Even Jeepneys, the colorful private open-air vans that take commuters to work or to run errands have "Waipahu" or "Hawaii" on them. The principal of one school Arakaki visited wasn't there because he was visiting relatives in the United States. The money from Filipinos working overseas is also helping to improve the standard of living in Sarrat and other provinces. Metal arches stand along local concrete roads in the neighborhoods in Sarrat. Each arch has the name of a donor, mostly overseas workers, who have donated the cost of 500 bags of cement. Once the road is built, the sections are named after those donors. Amid wooden homes with tin roofs are concrete mansions, rising above rice fields and other farm land. Many of the homes are owned by retired workers from Hawaii or people who are still working overseas. ILOCOS NORTE, Philippines » At the Ilocos Norte Health Hospital, Marites Ulep can thank doctors in Hawaii, who donated time, medicine and equipment, for enabling her to smile again. The medical team that came here arranged for transportation and for Ulep's case to be handled without charge back in Hawaii. Doctors at the hospital showed Gov. Linda Lingle other examples of the public hospital's ties to Hawaii -- a CAT scan machine that was donated by Kapiolani Medical Center for Women and Children, hospital beds, medical supplies and even ambulances with the word Aloha written on the back doors. Two more ambulances are coming, Lingle was told. Near San Nicholas, Lingle visited a private hospital that is being built with the help of overseas Filipinos who have invested in the project. The hospital is still under construction, but the first 25-bed phase could be open next month, said Dr. Bienvenido Romero, who is leading the effort to get the hospital built. Eventually he hopes to have 100 beds. The facility will serve an area where the nearest hospital is 20 kilometers away, Romero said. Even though it is a private hospital, by law a percentage of the beds will be available for those who can't pay. Romero said it cost about six-million pesos, or about $114,000, to construct the first phase, but that does not include the cost of medical equipment. He has dreams of providing high-quality medical services to people who have come to the Philippines to retire, perhaps even attracting patients from other countries for lower cost surgery than can be done in their own countries.